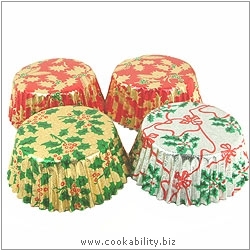 Foilcraft muffin cases in three Christmas holly and ribbon designs: Design and mix may vary. Supplied in a polypropylene container for easy storage. Dimensions: 50mm base x 38mm high. Colours may vary.